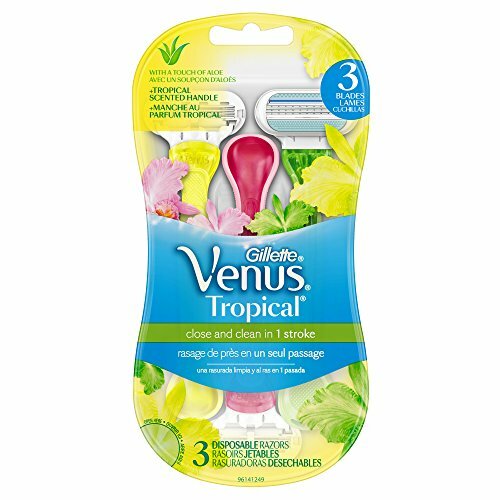 Gillette Venus Tropical disposable razors for women come in bright colors, featuring a fresh-scented, comfort grip handle, so you can get a smooth shave for beach-ready skin. 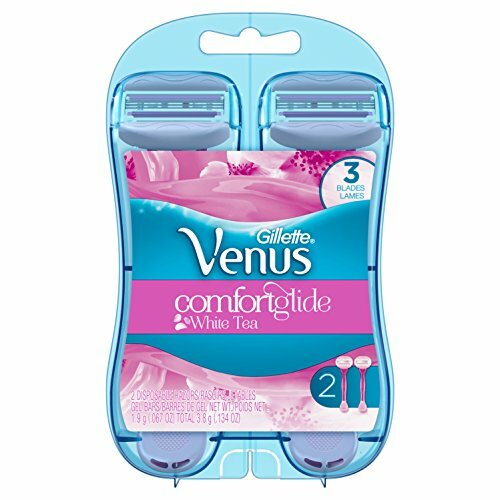 Venus Tropical disposable razors have 3 razor blades surrounded by soft, protective cushions and a Moisture Rich Strip with lubricants including a touch of Aloe for a great glide. 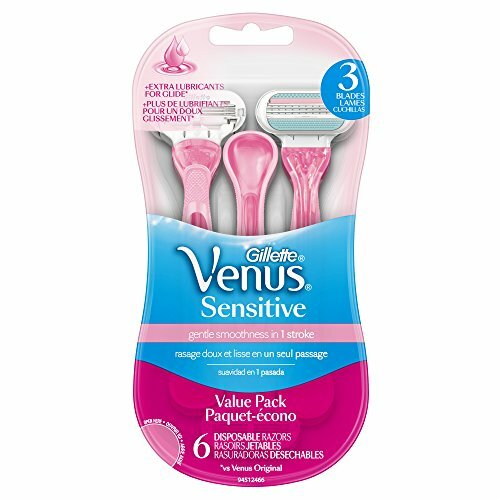 Each package contains four Venus Tropical women's disposable razors. 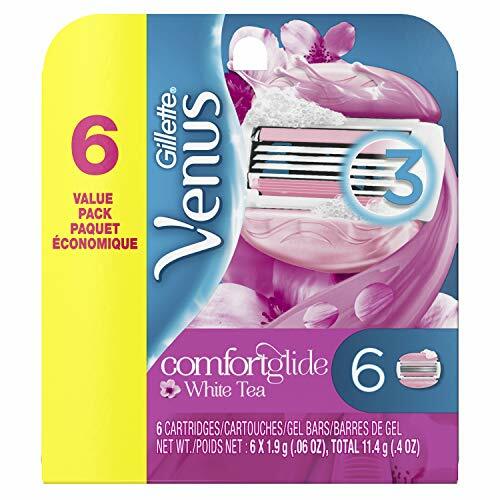 Wrap your skin in Comfort with Venus ComfortGlide White Tea razor blades. With 3 curve-hugging blades and built-in Soap Bars that release lush body butters with a White Tea Scent for an incredible glide, comfort and shaving experience. 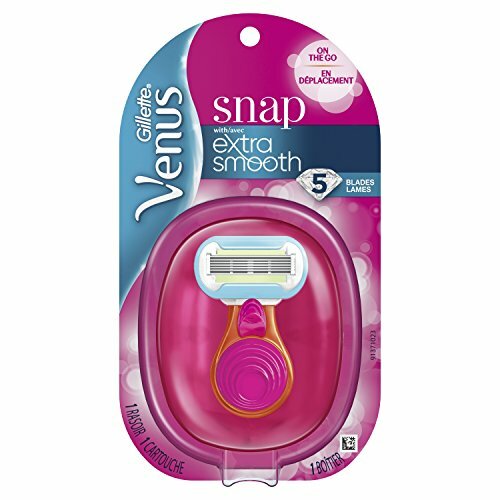 Experience instant smoothness on-the-go with our Venus Snap with Embrace Razor. With 5 curve-hugging blades, a mini-handle, and a portable compact you ll be ready for anything, anytime, anywhere. Choose smooth countoured moves! 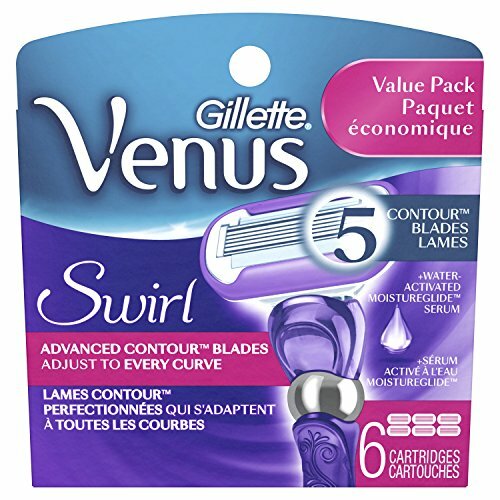 Gillette Venus Extra Smooth Swirl Women's Razor is designed with Gillette's revolutionary Flexiball and 5 individually adjusting Contour blades, the Venus Swirl helps capture what other razors may miss. It contours over curves for flawless beauty, long-lasting smoothness and virtually no missed hairs. Built-in shave gel bars with rich body butters and a fresh white tea scent eliminate the need for additional shave gel or soap. 3 razor blades for a close shave. No razor blade change required; just use and toss. Includes a convenient travel cap, perfect for the goddess on the go. 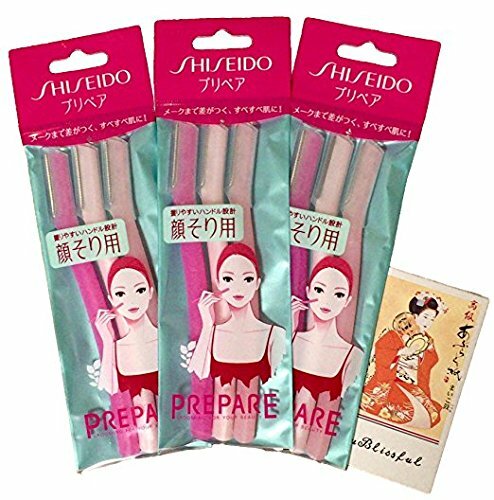 shiseido facial razor 3pcs(L) x 3 Pack. Unnatural looking eyebrows? Or any mean hairs sticking out, destroying your beautiful look? 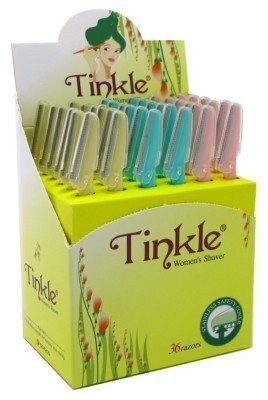 These high quality tinkle women's shaver will enhance the beauty you possess. You will be getting 36 tinkle women's shaver. It can be used as an eyebrow trimmer and brow shaper, and an upper lip hair remover, plus nose and ear hair remover. Quickly and comfortably removes unwanted hair from eyebrow and face. Eyebrow razor can easily trim and shape eyebrows to your desired style. Eyebrow scissors can easily cut eyebrows to your desired length. Eyebrow tweezers can easily unplug the eyebrow which is difficult to trim. What You Get: 3* eyebrow shaving razors, 1* eyebrow trimmer comb, 1* tweezer & 1 year warranty and lifetime frindly customer services. 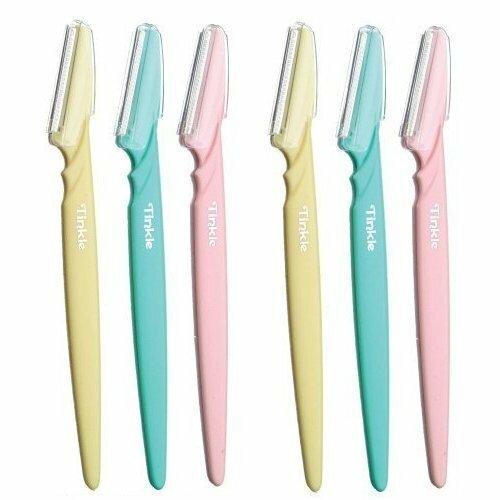 Eyebrow Trimmer Comb: Comb and scissor combination allows for precision trimming long eyebrows easier neatly and more beautiful. 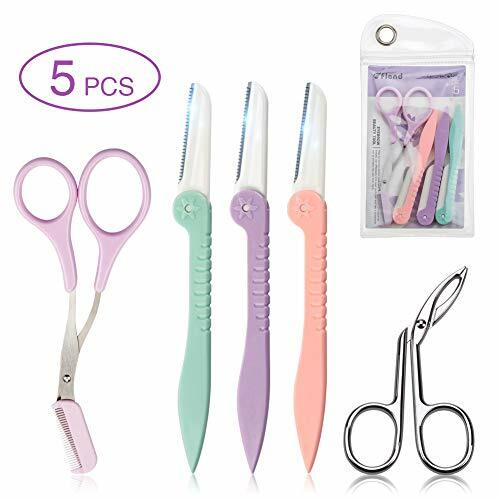 Unique Scissor Shaped Tweezer: Ergonomic design ideal for easy eyebrow tweezing, much efficient than traditional tweezers. Derived from professional IPL, developed with dermatologists .ZDATT uses an revolutionary light based technology called Intense Pulsed Light (IPL) to break the cycle of hair regrowth. Gentle pulses of light are applied at the root and, after several treatments, hair is prevented from growing back, resulting in permanently hair-free, beautifully smooth skin. However, this IPL device is not recommended for use on very blonde, red, grey or white hair where the smaller amount of melanin does not absorb the light. 1. Up to 96% hair reduction in 3 treatments. 2. Integrated ice cool function to cool down the area and protect your skin. 3. Imported quartz bulb allow for quick reloading and faster pulses. 4. The 350,000 flashes deliver an equivalent of 15 years of full body treatments. 5. Integrated UV filter that prevents your skin from damage during the treatments. 6.ZDATT gives you the flexibility of five energy settings for personalised treatments. 7. Skin rejuvenation: improves the quality of your skin at every layer, result in silky-smooth and younger-looking skin. 365 Day Money-Back Guarantee100% Satisfaction or your money back! If you don't think your hair removal device has delivered superior results, get your money back. Only ZDATT lets you try the IPL for 365 days with an exclusive money-back guarantee. One Year WarrantyAll IPL hair removal device of ZDATT matches the highest quality. But if anything happens to your device within the 1 year warranty period, we will send you a new one at no cost to you. Fast and safety treatments: The IPL Technology replaces traditional hair removal methods such as waxing, shaving, creams, gels and epilators, and allowing you to treat a full body in just 30 minutes. Over 95% hair ingrown in just 8 weeks. After 4-6 month usage, the hair is visibly less and hair-growth is prevented, achieving a long-lasting and efficient hair-removal experience. 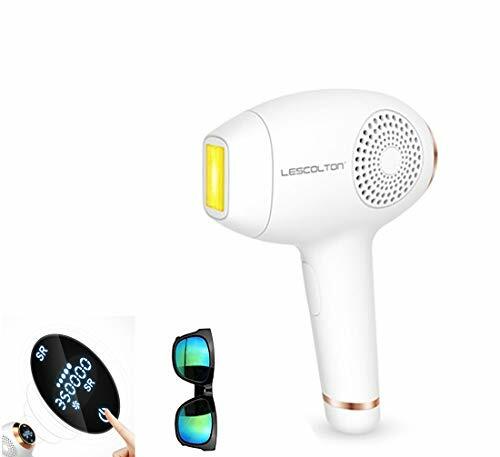 The latest integrated design :One Lamp with 350000 Flashes Hair Removal and Skin Rejuvenation Flashes,You can switch at one button without changing the lamp holder, allowing you to switch freely on hair removal, skin rejuvenation and ice cream. WholeBody Permanent Hair Removal : If you are care about quality, safe, fast and simple, this product exactly for you. It's includies up to a long life lamp. Ideal for full body hair removal, including bikini line,arms, underarms, legs, back and chest. It includes a skin tone sensor to ensure your skin and hair tone are suitable, as well as five adjustable light energy settings to ensure gentle but effective treatment. Safe and non-irritatin:without any adverse reactions or side effects,approved by security certification from European Union CE,1 year warranty, lifetime VIP after-sales service. Five Treatment Levels : Five adjustable energy levels settings to ensure gentle but effective treatment. You can adjust the level according to the skin area and hair growth. Used correctly, IPL treatment is comfortable and gentle to use even on sensitive skin and sensitive body area. 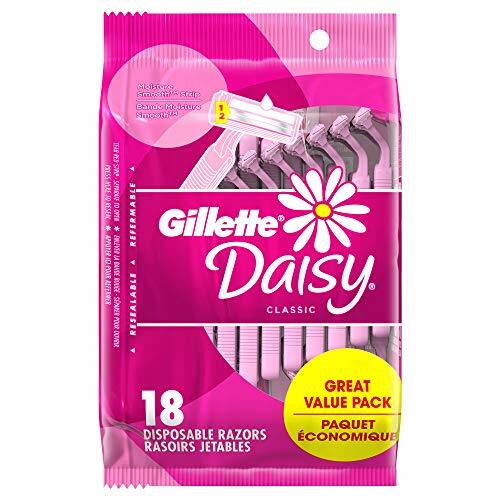 Gillette Daisy Classic Women's Disposable Razor, 3 Pack x 23 Razors Each (69 Count Total) Daisy Classic disposable razors for women have comfort blades, a moisture-smooth strip, and comfort handle to give you a close shave. Gillette comfort razor blades are thin to glide effortlessly for a smooth shave and the comfort handle is designed for a secure grip. 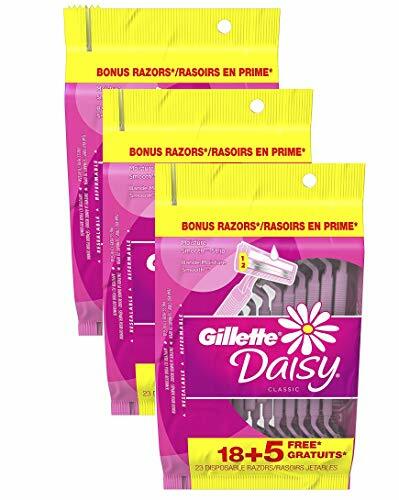 Each package contains 5 Daisy Classic disposable razors for women. GET A SMOOTH FACIAL SHAVE WITH NYLEA'S PREMIUM TRIMMING TOOLS - are you looking for a high quality tool to style and trim your facial hair? Nylea's IMROVED exfoliating dermaplaning tool is everything you need to shape eyebrows, remove fine facial hairs, and even smoothen your skin. Your face deserves the best possible care. Our professional eyebrow razor works great and is ideal for both men and women. 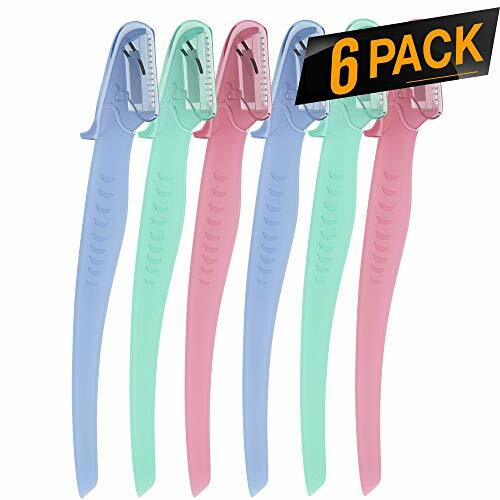 MORE VALUE FOR MONEY WITH A PACK OF 6 EYEBROW RAZORS - want to save money on the best beard trimmer for maintaining your facial appearance? 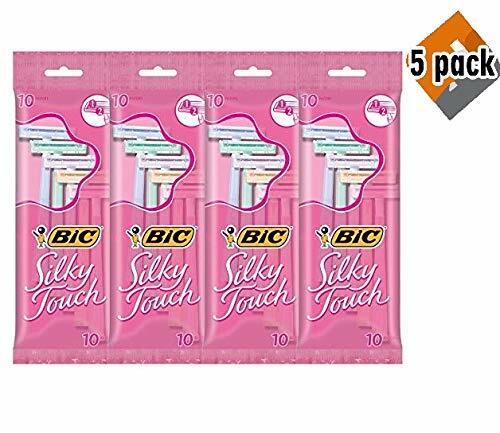 This product pack includes a total of 6 pieces so you get maximum value for money. There are 2 pink pieces, 2 blue pieces and 2 green pieces so you have a color to go whenever needed. Order our retail pack of the best eyebrow razor at wholesale pricing today. What's more, these are also slim and portable so you can touch up anytime, anyplace. REMOVE THE HASSLE OUT OF SHAVING FACIAL HAIRS - whoever said shaping your eyebrows and trimming those split facial hairs had to be a delicate, time-consuming task? Nylea's exfoliating dermaplaning tool is completely easy to use for everyone. Softly and painlessly remove your excess hair, eyebrows and facial beards. Each particular razor is non-slip for an easy grip, and just sharp enough for precise control. SAFELY TRIM SENSITIVE AREAS WITH OUR HIGH QUALITY RAZOR - do you sometimes have problems trimming sensitive areas around the eyebrows, upper lip, cheek fuzz, bikini lines, or chin hair? Our multi-purpose hair trimmers come with high quality blades that are specifically designed to deal with stubborn facial hairs. Micro guards help protect your skin while the stainless steel blade works its magic through unwanted hairs. 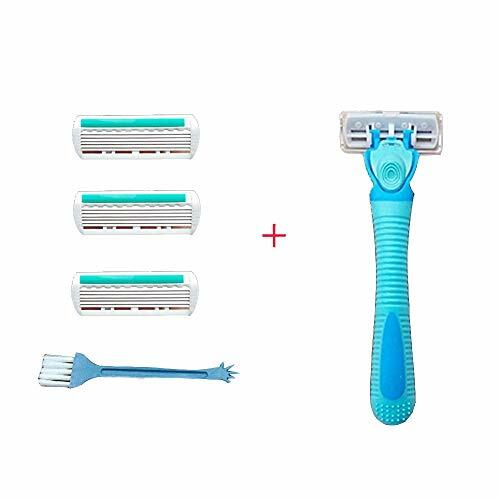 DEPENDABLE FACIAL HAIR TRIMMING KIT OR YOUR MONEY BACK - you get a highly reliable pack of 6 exfoliating dermaplaning tool, or your money back. If for any reason you are not happy with this product, simply let us know and we'll make it right. At Nylea, we put the satisfaction of our customers above anything else. Order your Nylea eyebrow razor pack risk free today with our premium brand guarantee. Our women's shavers use high-quality stainless steel titanium-coated blades to prevent sensitivities, and the 6-layer blade can be scraped cleaner. The plastic box is easy to carry and store. Material: High-quality ABS materials, durable, open architecture system makes blades easily to rinse. Simple quick and safe blade replacement, more convenient. 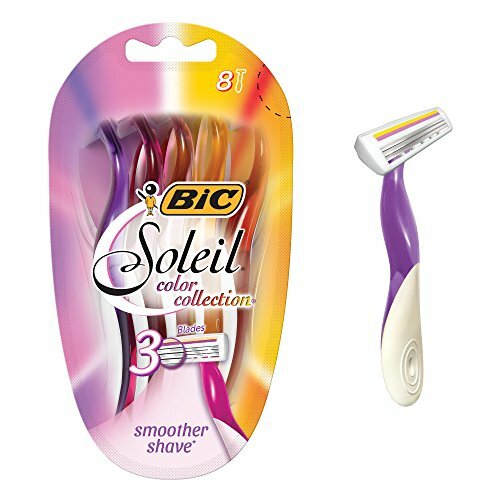 Smooth shave: Specifically designed to conform to the natural curves of a woman's body. With a pivoting head, they work great for armpits, legs, and the bikini area. Contours to provide a smooth shave around delicate areas like knees and ankles. Feature: Quick rinse technology keeps the blades clean, giving you a close shave every time. Ergonomic handle is easy to hold. Blades are comfort coated with aloe to prevent irritation. Convenience: This portable shaving tool is convenient to pack and carry with you on the go! Great for business, family and holiday travel. Warranty: If you find any defective product please contact with us in first time, we will replace you a new one for free. Multifunctional and portable.Satisfy your all kinds of demand. Useful when traveling,outdoors cosmetic demand. CONFORMS WITH TSA GUIDELINESS - Premium empty travel containers durable yet flexible easy squeeze air travel accessories. 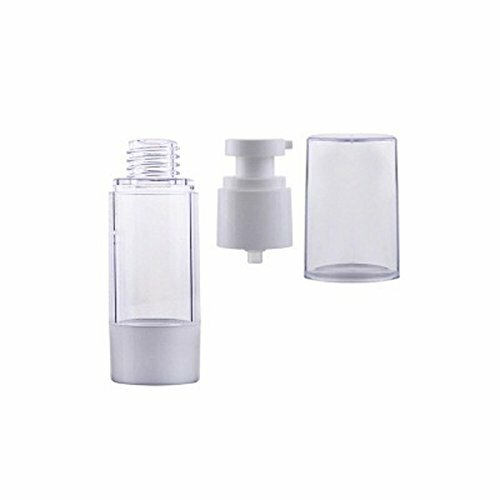 Ideal travel container for liquids, liquors, food, oils, shampoo, lotion, creams, gels, cosmetics, hand lotion, serum, moisturizing lotion, face lotion, vitamin face gel, hand sanitizer, makeup primer. CONVENINET, DURABLE AND DESIGN PRACTICABILITY - Washable and reusable plastic products and don't easily deteriorate. Bottles and caps are designed to keep the quality of its contents intact and secure, suitable for travel. Clean, durable, and resilient to contamination and leakage.